Switches feature full-length ties and a double-ended throwbar, allowing placement of the under-table switch machine on either side of the switch. 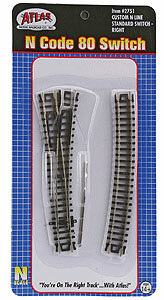 Atlas' popular Code 80 N Scale track features nickel-silver rail on black plastic ties. Copy this Code 80 Switch to your MY ACCESSORIES roster.